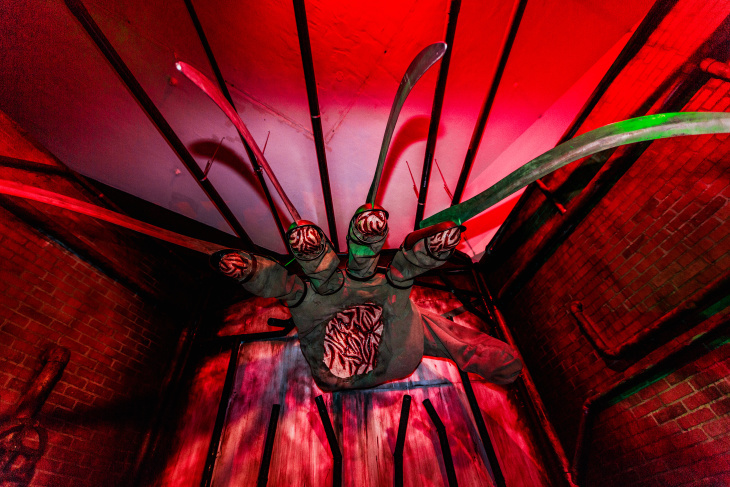 Horror aficionados love immersive scary movie experiences — places known to fans as "haunts" or "mazes," or to the untiated as "fancy haunted houses." 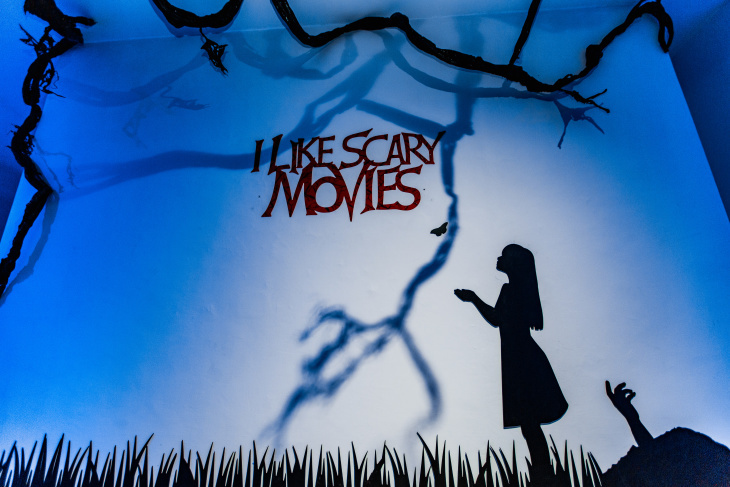 Now the interactive art installation I Like Scary Movies has arrived in L.A., offering a visitors the chance to enter terrifying worlds, without the jump scares. The pop-up features scenes from A Nightmare on Elm Street, The Shining, It, Beetlejuice, and The Lost Boys. The creators promise lots of scary photo opps, which you can either share now, or save to sprinkle through your social media feeds next Halloween season. 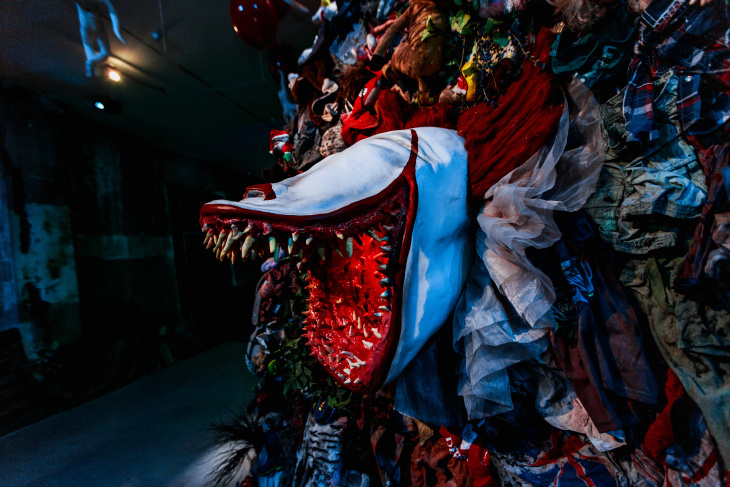 A trip through the installation takes somewhere between 60 and 90 minutes, and won't feature any "scare actors" or strobe lights — instead, the terror is supposed to come from the built environment. The items in the exhibition were created by self-described experiential artist Maximillian Castillo, who goes simply by "Maximillian." He's created similar movie-themed pop art over the years, like a Snakes on a Plane plane for Comic-Con and a La La Land dance event at City Hall. Castillo said it was an intentional choice to launch this pop up in the spring because for him, being a horror fan is a year-round lifestyle choice, one that merits more than a once-a-year holiday. He also said I Love Scary Movies is meant to be the "polar opposite" of the typical Halloween scare mazes. "I've been creating those types of installations, even when I was a kid. I would tear up my backyard," Maximillian said, "but I wanted to do something a little different. ... you're really left to explore on your own, and take your time, and contemplate these movies." He also promised lots of interactivity. One of the most epic interactive items on display is a giant version of Freddy Krueger's glove from Nightmare on Elm Street — you can even wrap yourself in his claws, if that's your thing. It's part of the Freddy's boiler room installation. When we spoke with Maximillian, he was actually outside the metalsmith studio, picking up the giant glove and claws to transport them to the building. "I wanted to create the Freddy glove as a true art piece," Maximillian said. "The joints and the fingers are going to be hinged, and you're going to be able to pull these five-foot-long knives, that are all done by hand, around your body." "The glove is going to be thrusting itself into this environment, making the guests feel as though they've been miniaturized, and Freddy is coming in and almost picking up a guest right out of that room," Maximillian said. The 2,000-pound glove was built by five different teams. The experiences on offer also include a chance to sink into the carpet from The Shining's Overlook Hotel — and to move through the famous "redrum" hedges. 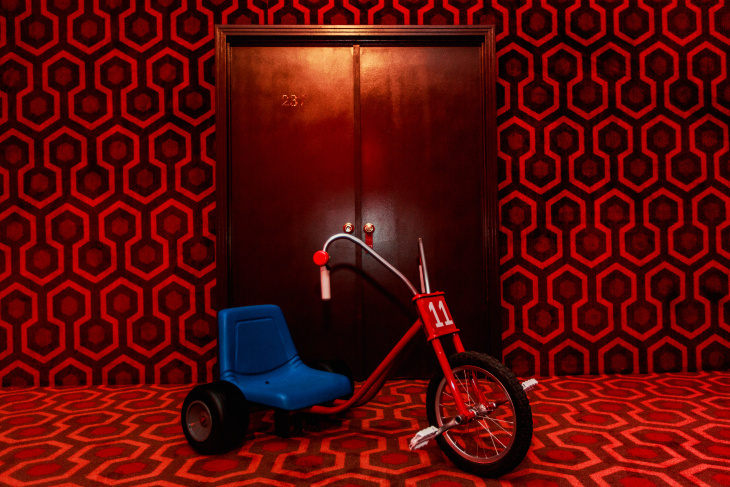 "I wanted [it] to have a deprivation sort of feel, where you would go into an area with an overall environment takeover, using the carpet pattern from the Overlook, and do some interesting things with sound," Maximillian said. If you aren't scared of clowns yet, you will be — when you travel into Pennywise's mouth before winding up in his sewer lair from It. After all this, you may be exhausted. Good news, there's also a chance for you to drop dead. 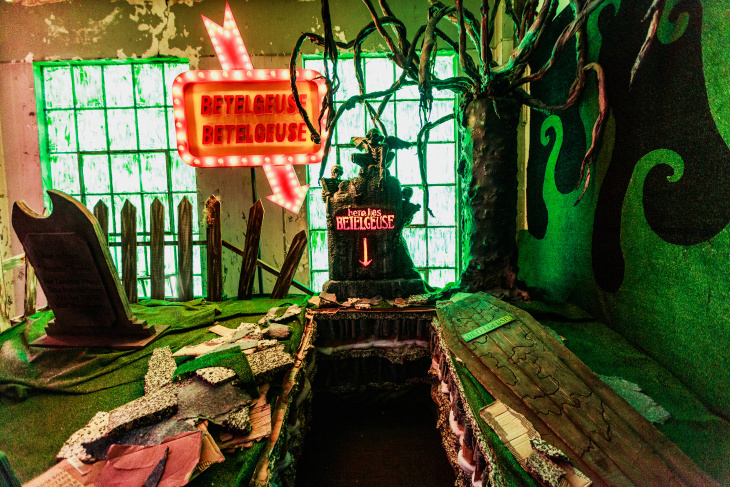 Well, to enter the Netherworld waiting area from Beetlejuice before visiting his graveyard. The Lost Boys doesn't get as much credit as a horror classic, known more for its iconic '80s cast (that features Kiefer Sutherland, the Coreys, and more). But you can jump into that world too, hanging from some Santa Clara train tracks before becoming part of the, ahem, "noodle" (read: disgusting bugs) dinner from the film. "I chose these five movies very specifically, and then just had a ton of different ideas that I wanted to do for each one," Maximillian said. "It's a big horror cocktail — it's all mixed up." Various illustrators came up with the designs based on the artist's concepts. "It lives in my head for so long," Maximillian said. "There's nothing like having the idea of the giant Freddy glove, and how I want it to move, and then actually seeing it happen. It's an incredible feeling, to actually see it come to life." At the end, the whole thing, of course, exits through the gift shop. Tickets for I Like Scary Movies are $39 each. It's at the Desmond Building in the Miracle Mile area, across the street from the El Rey. The plan is for it to run through mid-June.